If you really play hard, it's easy to get bruised and scraped up; the natural environment of scenario paintball can be hard on knees and elbows. When you're not wearing any protection, you realize quickly how often you're sliding, crawling, falling and kneeling when your sore after just the first few minutes of play. The best way to protect yourself is by wearing knee pads. Knee pads made for paintball are designed to be worn over your tactical outfit or paintball uniform to cover your knees with padding and a hard outer layer of plastic for complete protection. These knee pads are made of durable material meant to last through abusive, rough play in tough, natural settings. They attach with dual velcro fasteners and are fully adjustable; one size fits all. They have a non-slip strap that keeps them stationary when moving; inferior brands tend to slip and slide down the leg, however these will not. Play with reckless abandon wearing knowing your knees are covered; these knee pads feature comfortable, 1/2" high density foam padding and a hard outer layer of plastic that let's nothing through. This protective gear is a must for all outdoor players. These knee pads also come in nearly every camouflage pattern to match your tactical outfit; see options below for choices. 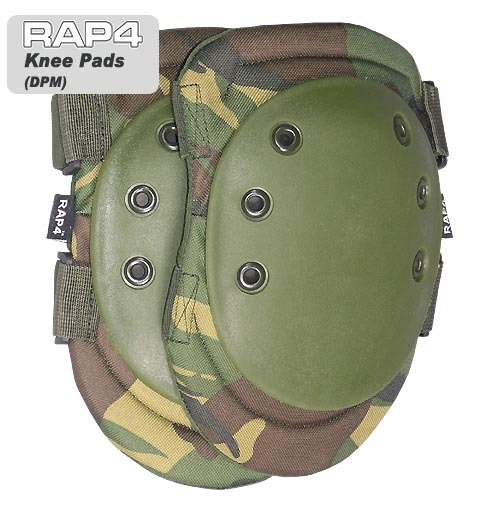 Buy these tactical knee pads from Choicepaintballguns for a discounted price and excellent service. Get the protection you need easily and securely shopping at our online store.